Joyce Khatibi yells at fisherman Jose Ortiz from her dock in Vero Beach. VERO BEACH – Hundreds of fishermen are expected to participate in the Fish Joyce’s Dock event on Saturday at 9:00 a.m. in Vero Beach. UPDATE: You can now watch the highlights of Fish Joyce’s Dock from a video of our stream. Sebastian Daily will be streaming the event LIVE Saturday. 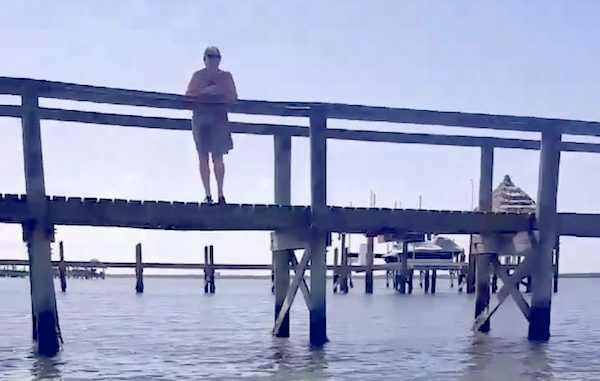 It’s probably fair to say that property owner Joyce Khatibi didn’t know what she was getting herself into after telling a fisherman that she owns the water in front of her home on State Road A1A, south of the Sebastian Inlet in Vero Beach. Jose Ortiz, of Melbourne, who uses the alias Tony Toca on Facebook, says he regularly fishes the docks along the waterfront property. But when he did so last Saturday, Khatibi started yelling at him and aimed a water hose in his direction. Khatibi told Ortiz she “owns the water” and that he’s not welcome near her dock anymore. Ortiz says he’s been fishing the docks for over 20 years without incident. Eventually, deputies from the Indian River County Sheriff’s Office were called and asked Ortiz to leave after they looked at online property records. However, a follow-up look at the records by Sebastian Daily showed that Khatibi’s property line didn’t extend into the water. Ortiz says the event initially expected about 400 people, but now it’s nearly doubled. Joyce Khatibi sprays Jose Ortiz with water from her dock. Ortiz recorded the exchange between himself and Khatibi on the dock. “I own from this telephone pole all the way down,” Khatibi yells from the dock. “All of this water is yours?” Ortiz asks. 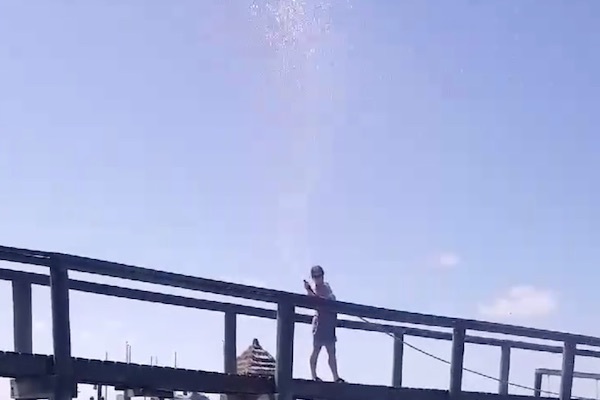 The fisherman then says, “I’m going to make you famous.” Khatibi then picks up a garden hose on at the dock and begins spraying water in the direction of Ortiz as they continue to argue. The exchange gets testy. Ortiz suggests she’s “rich” and “miserable.” Khatibi then tells Ortiz not to be jealous. Sebastian Watercraft Rentals is offering a great rental discount rate for the event. One of their pontoons will serve as the flagship boat with Ortiz.